1 A mother puts a smelly diaper in a trash bin. People fill a barrel in the park with used picnic items. A family stuffs torn gift wrap into a trash bag. A cook drops cans and jars in a trash can. 2 Every day we get rid of stuff. We throw out the things we no longer need. We can do this without fretting about the refuse [REF-use]. We know it will not pile up. The trash will not stay where we leave it. The odor will not make us pass out. Those who live in cities, towns, and suburbs trust their garbage collectors. 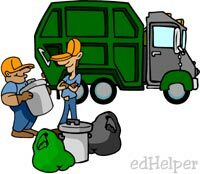 Garbage collectors - or trash men - come and haul the refuse away. 3 You probably have trash men who pick up your trash. People who live in the country may or may not have trash pickup. Trash men come down all streets each week. It is their job to haul trash away. They keep our streets clean. By removing garbage, they keep rats from moving in. They keep germs and disease from spreading. They save us a weekly trip to the dump!